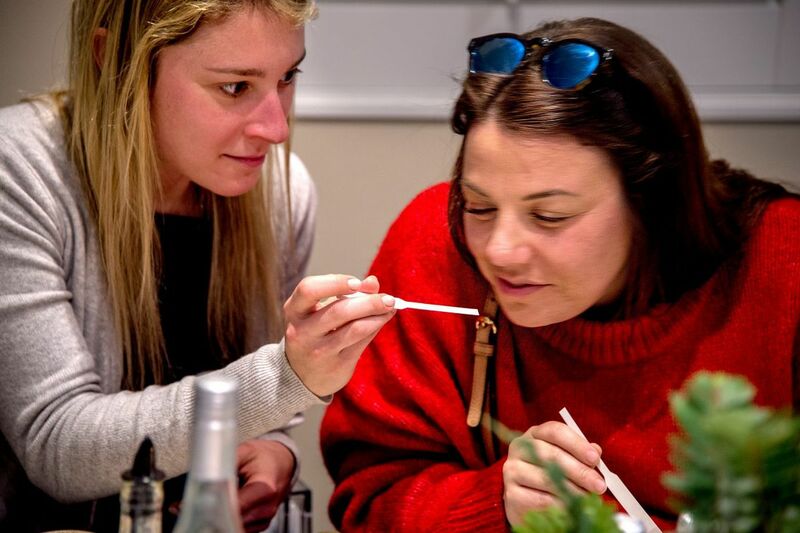 Mariel Levey (left) and Amanda Shor (right) sniff scents as they attend candle-making party with friends, at the new Philadelphia experience: Wax and wine, where one drinks wine and makes candles. Wax & Wine — Center City's new spot where visitors make candles as they sip vino — started to tease my nose the moment I walked through its weighted, velvet curtain. A pungent yet pleasant combo of all things citrus, floral, and musky enveloped me. And then — pow — I wandered into the vast smell-a-palooza that is Wax & Wine's scent cellar. "Here lives the 75 scents we use to make custom candles," said Jordan Beletz, the 24-year-old mastermind behind Wax & Wine. Once I descended, I couldn't stop sniffing. I took a whiff of teakwood, a dead ringer for the 1990s cologne Fahrenheit. Then I unscrewed the top of something rosy. Next, on to fudge. Excuse me, was that a Tootsie Roll? "I love DIY trends," said Beletz. "I love entertaining with a twist. I thought if I came up with a DIY project in a nice atmosphere with a product that people could actually use, I thought I might have something." Wax & Wine ticks a lot of lifestyle trend boxes. It's totally rustic chic; taps into mindfulness goals through the burning of candles, essential oils, sage and incense; and it's eco-friendly (the candles are made from coconut wax, and Beletz wants to recycle the wine bottles into candle holders). And it's part of larger trend of doing, rather than consuming. "Not only do people want experiences, they want to be made better by the experiences, whether it's through charitable giving, learning a new skill, or picking up cultural capital," said Allyson Rees, senior editor for retail lifestyle at WGSN Lifestyle & Interiors, the Los Angeles arm of the global trend forecasting company WGSN. "This Wax & Wine concept also provides 'taste makers' an education, something they can take with them to the next dinner party." Finally, candle-making is an extension of the DIY trend in retail that taps into the most powerful sense we have: Smell. Jamie Moskovitz smells one of the 75 available scents. The hospitality and restaurant industry has been futzing around with our olfactory memories in the name of experience-making for a few years now. Hotels like Loews Philadelphia pump a mystery scent through their vents that's so recognizable I know I'm in Loews the moment the glass doors open. And some upscale restaurants, like Center City's Ocean Prime and Wayne's Autograph Brasserie, have paired with candle companies like Seventh Avenue Apothecary and Diptyque for dinner/cocktails/dessert and scent pairings. You smell the candle, and then you get to dine on something inspired by that scent. This spring, Invent Your Scent, the perfumed version of painting and sipping parties, will roll out in local bars and restaurants, including the Moshulu. Rather than painting or making a candle, you'll create your own perfume. "The world right now is chaotic in many, many ways … scent-making is self-soothing, it's comforting," said Robin Darrow, who co-owns Invent Your Scent with husband Chuck Darrow, a former writer for the Philadelphia Daily News. "Right now, people would rather spend their money and their energy on making something rather than going out and buying a sweater." Beletz is betting on that. This time last year, Beletz was a salesman for Milwaukee Power Tools in Los Angeles. During the summer, he visited a flea market and happened upon a booth where people could make scented candles, shop the rest of the market, and return to pick up their creations. An idea was born. Jordan Beletz helps a party of candle-makers pick out their scents at Wax & Wine. Beletz began researching places with similar ideas. He visited candle-making spots, too, and was often the only guy in the room. Within a few weeks, he wrote a business plan and when he had all of his wicks in a row, he presented the idea to his dad, Alan. The senior Beletz, once a co-owner of the Northeast glass manufacturing company Beletz Bros. Glass, wasn't sure how bright the candle-making business could burn. "He convinced me that this was a platform for so many different things: like candles and calligraphy, candles and yoga," Alan Beletz, 54, said about his son's ideas. "This is just the beginning. Who knows, maybe we'd bring in an aromatherapist?" The whole endeavor entailed an investment of about $200,000. Since opening in early March, Wax & Wine has hosted two bridal showers and a few birthday and just-because gatherings. You can walk in and make a candle, or you can rent out the back room for a party. It costs $30 to make one eight-ounce candle ($45 for two and $50 for three), about the same it costs to buy a 14-ounce Yankee Candle. On a recent evening, 12 women in their late 20s and early 30s arrived at Wax & Wine, wearing long coats, long hair, and with wine in hand. Beletz opens bottles one by one and the women settle around a long table set with all the tools needed to tap into their inner chandler: a tiny whisk, a silver jigger — not for measuring whiskey, but fragrance ratios — a Popsicle stick with a tiny hole in it designed to keep the wicks straight. A satchel of coffee beans is nearby to clear the nasal palate between sniffs. Candles in the making at Wax & Wine. After about a half hour of sipping, sniffing, giggling, and more sipping, the scent combos emerge: spearmint and white wine, oatmeal and white linen, hot fudge and vanilla. "Making a candle and having a great time with your friends is different," said 28-year-old Rachel Gendelman, who organized the evening with friends. Gendelman's candle was a combo of two scents: fruit slices and champagne she named Anthro. "It smells like something I once bought from Anthropologie," Gendelman said. "We had a great time. I'd definitely go back." Wax & Wine is at 1034 Pine St.; 215-309-3424, waxandwine.com.